Powdery mildew exists wherever grapes are grown for wine. 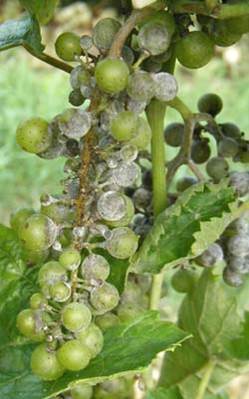 The fungus that causes grape powdery mildew is an obligate parasite, which means it must grow on grape tissue and will not parasitize any other species of plants. The fungus penetrates only the epidermal cells sending tubular suckers into them to absorb nutrients. 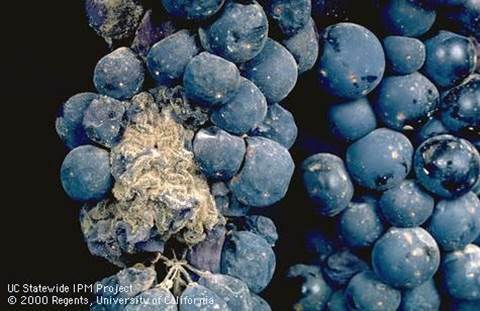 The mass of fungal growth on grape skin give the impression that the grapes are sprinkled with flour. This impression is enhanced by the smell of moldy flour released by the diseased grapes. Fungicide sprays effectively control the incidence of powdery mildew of grapes from 99% to < 1% which is very important for the quality of wine. “Analysis of wines made from powdery mildew-affected grapes has revealed that even slight infection leads to compositional changes, an oily mouthfeel and undesirable fungal/earthy flavours when compared with wines made from disease-free grapes. The strongest link to the effect of powdery mildew was elevated ratings of ‘oily’ and ‘viscosity’ attributes in wines made from grapes with as little as 1-5% powdery mildew compared to wines made from disease free grapes. …wines made from diseased grapes were rated as having more pronounced fungal, earthy and cooked tomato aroma attributes than wines made from uninfected grapes. Juice from the most severely diseased grapes had a dusty and mushroom aroma and acid taste compared to the others. Source: Wine Industry Journal. 2004. 19:71-75. Most of the table grape production in the U.S. is located in the San Joaquin Valley. Rainfall at harvest is uncommon. However, when it does rain, gray mold can reach epidemic proportions if fungicides are not used. Gray mold is caused by a fungus that is activated by rainfall. The fungus produces a short tube with a suction cup and a peg that forces its way through the grape cuticle. Inside the grape, the fungus grows and exudes enzymes that degrade the fruit. Cracks form in the grapes and spores are produced that spread gray mold to other grape clusters. 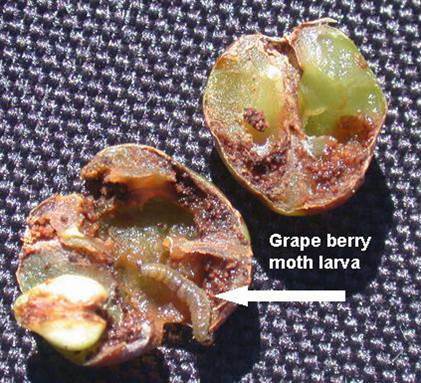 Even a single infected fruit within a table grape package can cause severe losses. Authors: J.L. Smilanick, et al. Source: Plant Disease. 94:250-257. 2010. Chile leads the world in the export of table grapes. A major challenge for Chile is the distance from the fields to the export markets. The long distance makes necessary having grapes of extremely high quality that can endure the trip and have a long shelf life. Botrytis is a disease that severely affects stored table grapes because it can infect the grapes in the field and then continue to grow in the berries’ storage, producing nests of gray-white fungus. 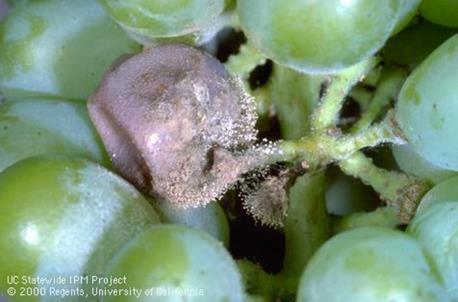 Botrytis is common in Chilean vineyards, so the development of mold is prevented by the use of fungicides. Title: Prevalence of isolates of Botrytis cinerea resistant to multiple fungicides in Chilean vineyards. Publication: Crop Protection. 2012. 40:49-52.